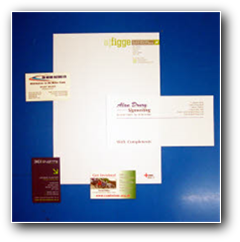 We can supply all your printed stationery requirements and as we provide artwork to other printers we can always provide the most competitive price. If we have your logo on our system it will be used for stationery as well as your signage, vehicles and garments so you can be assured that your logo will be faithfully reproduced throughout. If you wish to supply your own artwork, click here for required specifications. For all your stationery requirements.